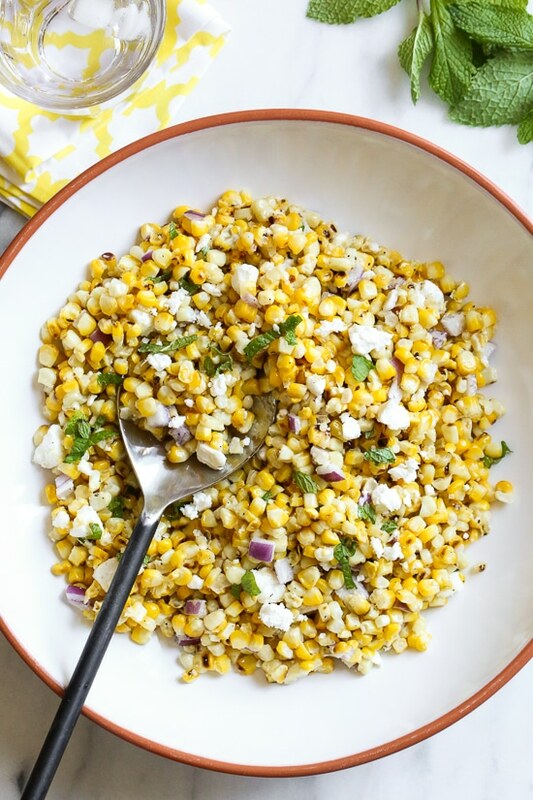 Sweet summer corn doesn’t require much fuss to make it taste good, but the combination of sweet corn and slightly salty Feta cheese is simply magical, whether you enjoy this warm or cold! Toss in some fresh herbs and you have a winning salad combination. 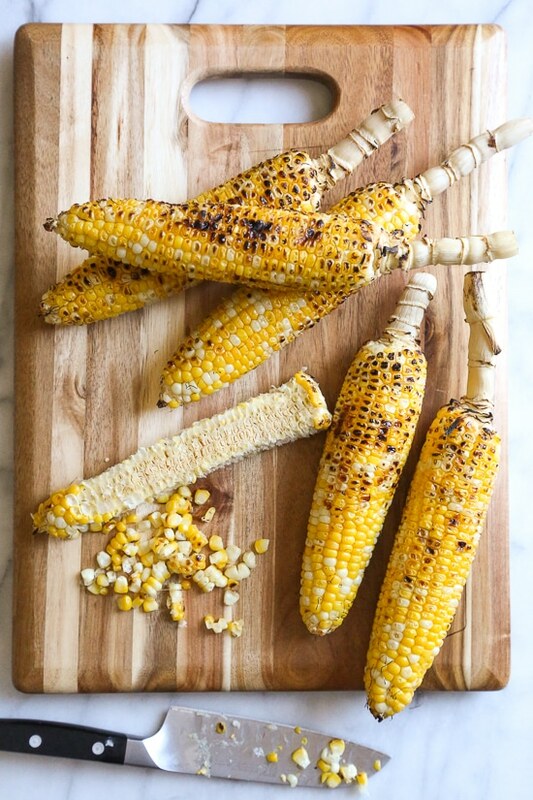 This is the easiest method for grilling corn with charred edges. Peel the corn and remove the silks. 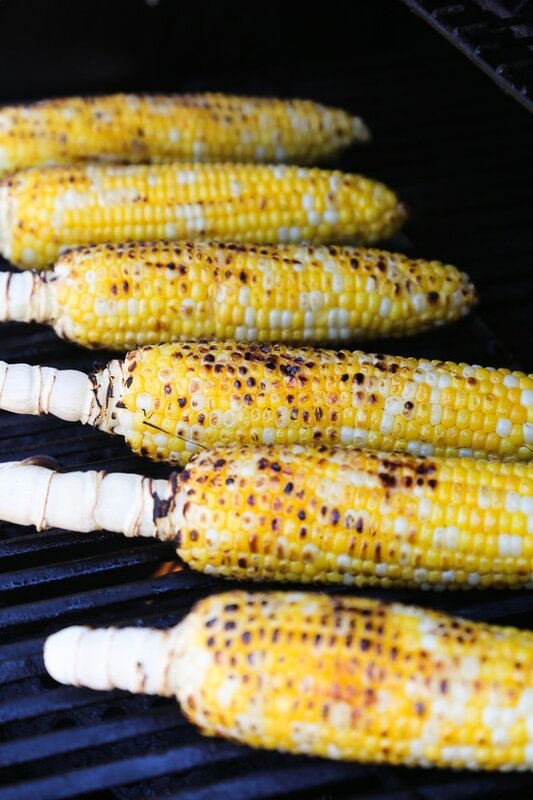 Lightly spray corn with a little oil then grill over direct heat, turning the corn often until it is charred all over, about 12 to 15 minutes. To shell the corn, let it cool a few minutes then transfer to a cutting board and hold the corn upright. Using a sharp knife, cut the corn off the cobb. Corn can be grilled a day ahead before assembling the salad. Swap the red onion for chives. For a Mexican twist, add fresh cilantro, avocado and lime juice. This charred Grilled Corn Salad with Feta is an easy 5-ingredient summer side dish or light lunch. It goes perfect with anything you’re grilling! Set the grill to medium-high. Husk the corn. Grill 10 to 12 minutes, turning often, until charred in spots. Transfer to a cutting board and set aside to cool. Cut the kernels off the cobb. 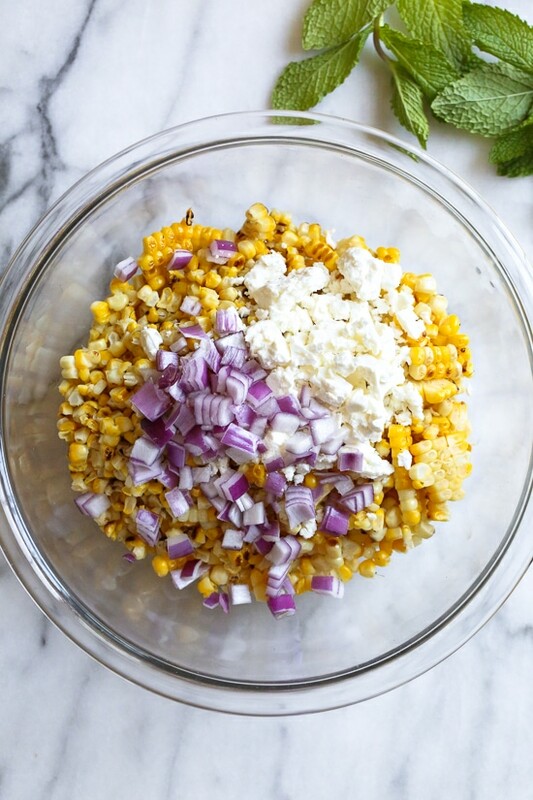 Put the corn, red onion and cheese in a medium salad bowl. Drizzle with the olive oil and toss. Add the fresh herbs and toss again. Taste and add salt and pepper. Serve. Corn can be grilled 1 day ahead before assembling the salad. Can be eaten warm or cold. Do you have a recipe for sandwich filling using halibut instead of tuna? and what spices ! A hit every time I make it! Sure, I would just add the Feta right before serving. This is wonderful!! Used low fat Feta and mint for the herb. Plus I had never grilled corn directly on the BBQ before. It was so easy and the smell is divine! Paired this with the salmon and avocado bruschetta plus grilled asparagus for a perfect dinner party. Everyone loved it!! Thank you Gina! This was amazing! Originally, I was going to use parsley; however, my grocery store was out of it, and I decided to try it with mint. The flavors go together so well. Nice job on this one! Got rave reviews on this last night! Added zucchini and cherry tomatoes, and a squeeze of lime juice, to the base recipe. It was awesome! I loved this recipe!! So good and fresh!! Dinner party with 12. Paired this with your Asian-Style Marinated Flank Steak and a bowl of sweet watermelon. Everyone loved it! I used the mint – and it was so cool and unique. Thank you Gina! I can always count on you! Love this recipe! Can you make using canned corn?? I may need to make a large batch. Thank you! Yes but fresh is best! Delish! I had a leftover ear of corn so decided to make just a small amount of this and served it on top of brown rice (with cauliflower….can’t convert the family to entirely cauliflower “rice” so I do 1/2 and 1/2) and it was a huge hit! This will be a summer staple for sure! Thank you Gina for the continuous stream of outstanding recipes! Can this be made a day ahead and still taste great? This was so very good!! Followed the recipe, did add fresh cilantro as suggested and also squeezed a fresh lime over it all. It’s a keeper! I made this and love it. No grill so just cooked the corn instead. Used green onion. Did not use any oil. Used cilantro and added a little lemon pepper. Served warm and also cold Great both ways, It would be so good for a potluck dish. A real keeper Thanks much. I also made it with the (frozen) Roasted Corn from Trader Joe’s and it turned out great. I used the suggested Mexican variation with added cilantro, lime juice, and avocado, and served it as a side for the SkinnyTaste Turkey Burgers w/ Zucchini. It was all so quick and easy to make and perfectly pleasing on a hot night! Made with dill and top it on grilled zucchini. Soooo delicious! 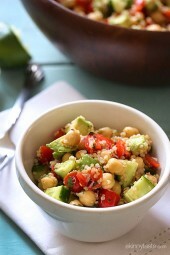 I definitely want to try making this with queso fresco! How much frozen corn is 6-7 ears of corn? This was fantastic! Easy, fresh and delicious! The perfect summer side dish. 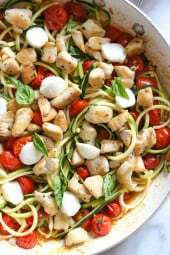 Made this for a cookout….received a lot of compliments and requests for the recipe!! Best of all no one knew it was a “healthy” type recipe. Definitely a keeper! Delicious. Grilled the corn over my gas stove top to make it easier. Really good recipe. This dish is easy to make an absolutely delicious. ;You’ve done it again Skinnytaste. Thank you. Made this tonight and it was such a hit! 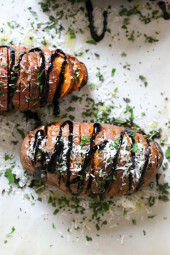 My new go-to for potluck and bringing a side dish! Using Trader Joe’s roasted corn in the freezer section would make prep a snap. Can’t wait to try it! Could sub cojita cheese for the feta? I love feta, but have cojita left from making Gina’s Skinnytaste Warm Corn Salad and I don’t know what else to use it for. Is there a way to make thus orn salad without grilling? Will broiling work? It sounds terrific!! Is there a specific brand of feta you use? I’ve been hit or miss with the ones I’ve tried. Might swap out for cotija cheese. I like the type in water, I crumble myself. would I also be able to make this indoors on a grill pan as well? Looks delicious!! I’ve tried but just can’t like feta so I always substitute—curious about what you might suggest as a possible substitution? Could I sub cojita cheese for the feta? 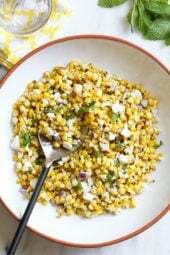 I love feta, but still have cojita from Gina’s Skinnytaste Warm Mexican Corn recipe and don’t know what else to use it with. Looks like the perfect BBQ side.! Do you think I can take a little shortcut and just use the fire roasted corn from Trader Joe’s? If you were to use the TJ’s roasted corn or something similar, what would be the ratio for 6-7 ears of corn?